Since evergreens retain their leaves over the winter they are susceptible to all the nasties of winter weather. They continue to use and lose water through their needles even when the ground is frozen. 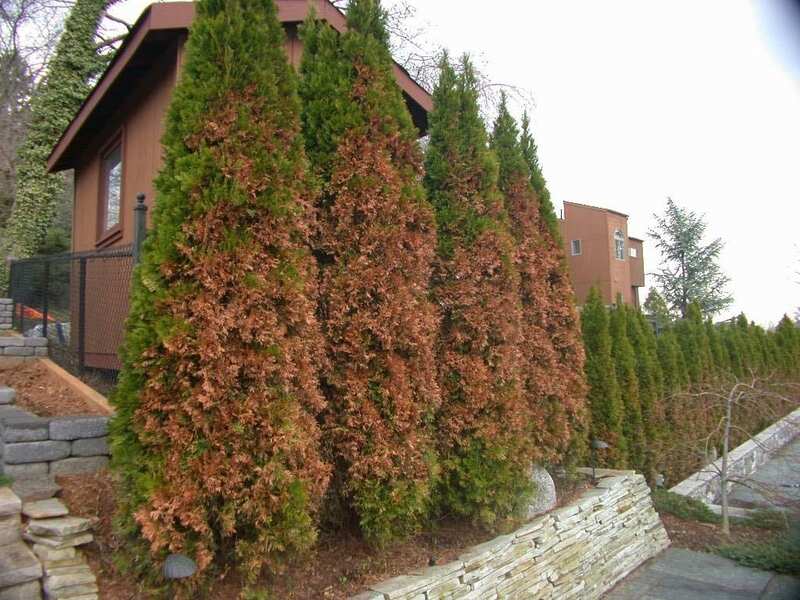 Evergreens turning brown in Winter means they maybe losing more water than they can replace. Both young and mature trees can also show browning from salt spray from deicing salts. Winter Damage. Evergreens do not tolerate drought very well. When water supplies are inadequate, trees will turn yellowish-green, then light brown, discoloring from the top down. Trees exposed to salt will also turn brown. Excess salt in the soil will cause leaf tips to turn yellow, then reddish-brown or reddish-purple. Over-application of fertilizer around the tree base can cause this problem. Salt spray will damage the side of the tree that faces the source and the leaves turn brown from the tips. Animal Damage. Dog urine turns evergreens yellow then brown, at just above ground level. Eventually the foliage turns black. Other animals, such as rabbits, mice and deer, eat bark, causing the foliage to turn yellow then brown. Winter damage does not show until the spring and summer debarking shows immediately. If the tree loses its bark all round its trunk, it will eventually die. Wind Damage. Strong winds cause browning on the side of the tree facing the wind. About one-third to one-half of the needle turns brown. Symptoms will often not show until spring or midsummer. Is there anything I can spray to avoid winter burn?